Forty percent of old road surface used in construction of four-lane dual carriage-way in the Free State. Bridge 322 is the biggest bridge in the project. It’s a post-stanchion bridge, as opposed to the traditional in-situ cast bridge. A single carriage-way between Kroonstad to Holfontein in Free State is being upgraded to four-lane dual carriage-way, thus reducing accidents and drastically easing congestion. The project commenced in 2015 and is scheduled to be completed in August 2018. At the end of February 2018, 80% of the project had been completed. All that remains is surfacing of the road and some finishing touches. Some innovations were used during the construction. At least 40% of the old road surface was recycled to be used in producing asphalt for the new road. This not only reduced the cost of the road but is also environmentally friendly. “We recycle the old road and mix it into the new asphalt and surface it onto the new road,” said Boeta Raath, plant and surfacing manager on the project. The labour complement on the project is a mix of experienced staff and local labourers from Kroonstad. The locals received training before the project started, which has given them valuable skills that will help them secure jobs in the future. A local company, Godfrey Mmuso Trading & Projects, is subcontracted to the main contractor, Hilary Construction. They do concrete work, v-drains and stone pitching. Palesa Pete, director at the company, said: “We joined the project in August 2017 and have learnt so much since. I would have never received the opportunity to work on a national road had it not been for SANRAL. The project also includes a bridge which serves as an interchange between Holfontein and Ventersburg. Bridge 322 connects two former gravel roads, one travelling east and the other west to Ventersburg. 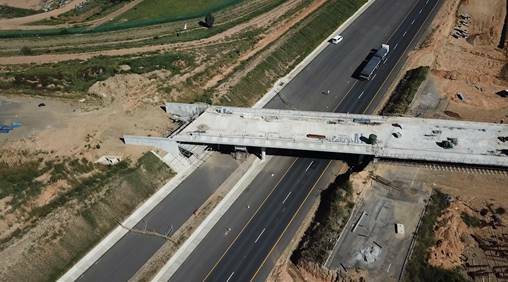 The road was dropped so that the N1 travels under the bridge. Bridge 322, the biggest bridge in the project, is a post-stanchion bridge, as opposed to the traditional in-situ cast bridge. One of the major challenges for the project was the heavy rainfall. The place where the bridge is being built is a low-lying area. Culverts are being built to direct and control the flow of the water.